A “Newfie-frog” I am. That is, I was born in Québec but lived in Newfoundland for most of my life. More recently, I’ve adopted the Maritimes as my home away from home and have been living and working here for a while now. I completed my BSc in Biology in 2006 at Memorial University, focusing on conservation and community ecology. Shortly thereafter, I entered the world of short contracts and community-focused conservation projects, where I’ve gleaned most of my experience in the field of conservation science. I’ve worked as a seal care-taker, a marine biology research assistant, as an avian field technician, a funeral-home attendant (surprise!) and an outreach biologist. Since the summer of 2007, shorebirds and their habitat have become a focal point for me and I can often be found on a beach somewhere gawking with my binoculars or dropping well-rehearsed comments to fellow beachgoers regarding the shorebirds of Nova Scotia. The project I will be working on is a Maritimes-wide initiative involving Parks Canada, the Canadian Wildlife Service and Environment Canada as well as provincial Natural Resource Departments (or equivalents) and a multitude of NGOs. Piping plovers (Charadrius melodus melodus) in Eastern Canada have been listed as endangered since 1985, and despite several years of conservation efforts the population continues to decline. We intend to use remote video monitoring of piping plover nests to investigate adult and egg predation, nest abandonment and the efficacy of nest exclosures used as a management tool for this species. 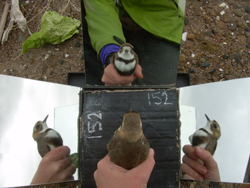 This study should give us a greater understanding of the threats that these and other shorebirds face on along the shores of New Brunswick, Prince Edward Island and Nova Scotia, and hopefully this will be a good ‘fly-hop’ forward for the piping plover. I’m a nature nut, I love canoeing, hiking and birding and I enjoy painting, knitting and learning new recipes.